By Janakiballav Dash: Bhagua a rare variety of improved pomegranate has made inroads into tribal Mayurbhanj, thanks to Horticulture department for this new initiative. Last year pomegranate was taken up in acres of tribal lands as an exemplary cultivation to see its benefits which proved to be beneficial. This has spurted the horticulture department which have taken up hectares of land for cultivation of this improved variety of pomegranate fruit, said DDH Dharanidhara Patra here. Pomegranate locally known as dalimba or bedana is rich in variety of vitamins, potassium, magnesium., etc. which have high in demand allover the world. 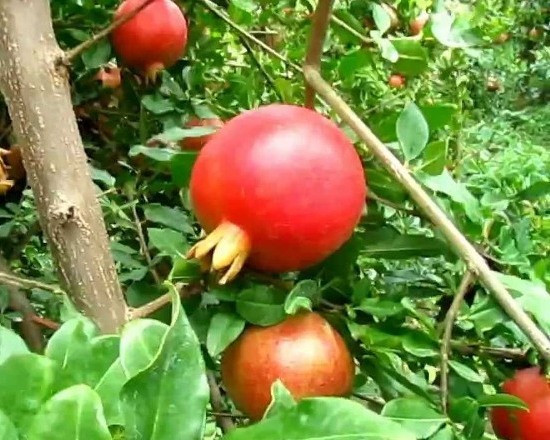 The horticulture department under the stewardship of District Collector Rajesh Pravakar Patil have directed to take up around hundred acres of pomegranate cultivation in Morada block area. Giving details of the project Dy.Dir.Horti.DD Patra said that in the villages of Ghaghra, Purnachandrapur,Harekrushnapur, Kaduani around 119 tribal cultivators lands have been taken up for this new variety plantation under Mgnregs. The entire programme is being supported by technical expertise of Maharastra based Jain irrigation company which will use its man & technology for its up keep & watch-word for next two years. There after it would start producing pomegranate of export variety. These rare seedlings of Bhagua pomegranate has been developed after tissue culture method whose export quality is very high in abroad said Sri Patra. These new technology has ultimately improving the lives & livelihood of tribal it is seen.